Intelligent dosing device and highly concentrated, ecological dishwashing agents (up to 5 times more concentrated than regular products) for perfect, clean dishes in professional surroundings. 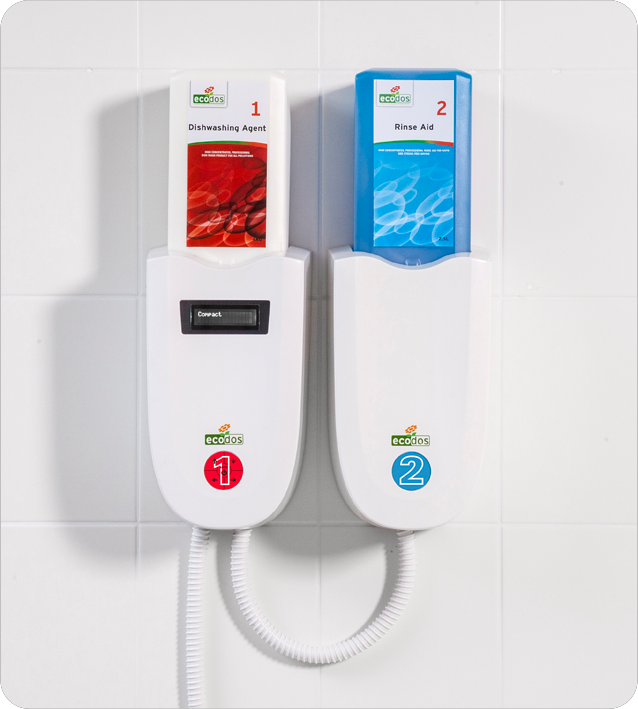 The intelligent dosing system makes it easy to monitor the consumption of dishwashing agents. With the data it is possible to control efficiency, costs, hygiene and the environmental performance efficiency. The system contributes to a safer and more ergonomic working area thanks to the use of colours, safety connectors and easy to handle and light-weight packaging. The products will take care of all types of soiling, including coffee and tea stains, regardless of water hardness levels. Thanks to the high quality and intelligent dosing system, substantially less maintenance is required (as well as maintenance costs). Moreover, the products are so concentrated that less transportation is needed, stocks can be kept low and waste is reduced to a minimum. The cartridges are completely emptied. Our skilled technicians take care of the installation of the products and guarantee a flawless use of the product, 24/7. On top of that, we train your staff on correct use. Therefore, we give a lifetime guarantee on the dispensers.